The loose cannon wizard Dresden has been recruited by the White Court to help combat the Vampires of the Red Court hell bent on taking over the world. 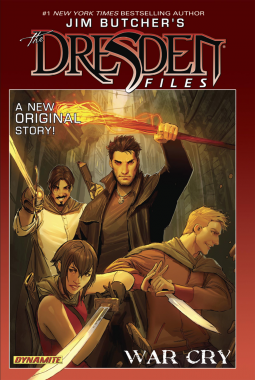 Dresden and a few new recruits are sent on a secret mission that starts to look more and more like a setup and a double cross than an actual mission. The story is good, it's engaging and it has everything that makes magical wars must reads; that being someone on the good side being secretly evil. There is a lot of killing and mayhem as Dresden and his crew try to hold of like 100+ vamps; talk about being the underdogs Dresden and three new wizards against all those vamps, damn. Don't sweat it though, the book is named after Dresden so he obviously has a plan or two to win. This is a definitely a series worth following up on and hopefully we'll get a better idea of who the traitor is; and the Red Court who is the Leader.